In 1914, as the Great War looms, the mighty Ottoman Empire is crumbling. Michael Boghosian (Oscar Isaac) is studying medicine in Constantinople, determined to bring modern medicine back to Siroun, his ancestral village in Southern Turkey. When he meets fellow Armenian, Ana (Charlotte le Bon), their shared heritage sparks an undeniable attraction and powerful love. However, Ana is in a relationship with American photo-journalist, Chris Myers (Christian Bale), and Michael is promised to a girl from Siroun. As the Turks form an alliance with Germany and the Empire turns violently against its own ethnic minorities, their conflicting passions must be set aside in a desperate fight for survival. I have to admit, to my great shame, that I know very little about the Armenian Genocide (also known as the Armenian Holocaust). Starting in April 1915, 1.5 million Armenians were systematically exterminated by the Ottoman government. How this horrendous moment in history, acknowledged as one of the first modern genocides, passed me by, I cannot explain. I do know that I am not alone in my ignorance - this tragic event is one of the least known catastrophes of the 20th century. Having read Robin Swicord’s script, director Terry George knew that The Promise was a story that needed to be told. However, George was concerned that audiences would shy away from the brutal truth of the genocide. “I looked to the great cinematic masters for inspiration - to David Lean who took us into the Russian Revolution in Dr. Zhivago and into the Irish War of Independence in Ryan’s Daughter, and to Warren Beatty who also allowed us to experience the Russian Revolution through the eyes of John Reid in Reds,” the director explains. George’s decision to use romance to tell his story is both the making and the undoing of The Promise. Audiences will undoubtedly be drawn in by the film’s impressive cast, historic narrative and Michael and Ana’s relationship. However, they may well leave the cinema feeling unsatisfied. 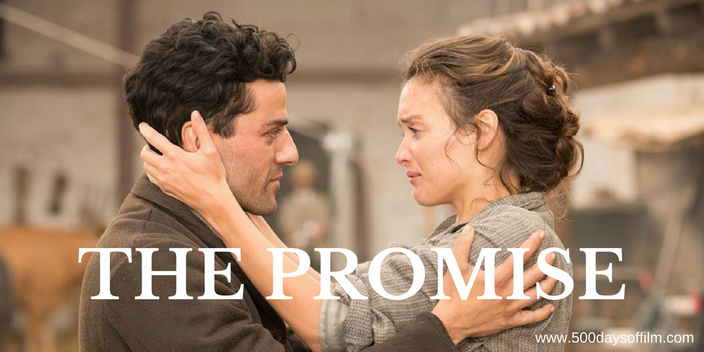 For, despite its hefty running time (2hrs 13mins), The Promise fails to engage and struggles to tell its tale. The film wants to convey so much - an epic love, a historic event, a tale of survival - that it becomes overwhelmed. As a result, George falls short in bringing the narrative strands together satisfactorily. (I wonder if there is a four hour director’s cut somewhere). Meanwhile, I found it hard to care about Michael, Ana and Chris’ relationship - particularly while a genocide is going on in the background. I felt there were far more interesting stories to tell. For example, the story of Musa Dagh, a mountain that was the location of a successful Armenian resistance against the genocide. However, I am grateful to The Promise for introducing me to this event and I look forward to watching more films on this moment in history. Have you seen The Promise?